Want to help North Korean refugees and those suffering in North Korea? KOREA The Seoul chapter of Liberty in North Korea (LiNK-Seoul) is working with LiNK-international on a major project in Korea in May. LiNK-Seoul meets every Saturday afternoon in Itaewon and attracts Koreans (including former North Korean refugees) and expats from around the world. LiNK directly assists North Korean refugees and orphans, engages in public advocacy and conducts education campaigns on North Korea's human rights crisis. To get involved, contact Eun Hae. If there is anyone in East Asia who would like to help, May would be a good time to come. Berkeley, California: For folks on the west coast of the USA, there is a series of events on the campus of UC Berkeley between April 24 and May 1. Southern and central California: There will be a series of concerts to raise awareness on North Korean human rights. Duluth, Georgia: There will be a fundraiser in for underground orphanages in China that help North Korean children. Washington, DC: April 22-30 is North Korean Freedom Week in Washington, DC. That includes two full weekends, so you can make one of them if you are in the Eastern USA. Registration is optional but recommended so they can better prepare for the events. Here is a partial list of events planned for that week. 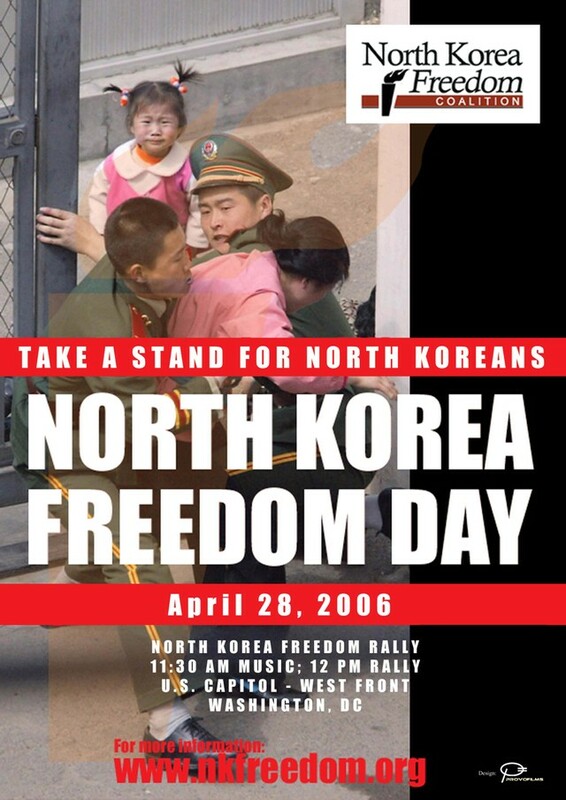 April 22, Saturday, 1:00 pm - 4:30 pm Concert and Program to Appeal to the World to Free All Abductees Held in North Korea. April 25, Tuesday, Panel Discussion, "How to Promote Information Flow to North Korea" Hosted by: Open Radio for North Korea Location: 2209 Massachusetts Ave., NW, Washington, D.C.
April 27, Thursday Press Conference: Leadership of the North Korean defectors’ organizations, South Korean and Japanese NGO leaders, and Congressional Witnesses: Major News to Announce! Location: 2170 Rayburn House Office Building. Most of the events have individual contacts, so be sure to click on this link to get the contact information for the sponsor of the event you want to attend. Of course, you can always just show up but events like these are often subject to change. EUROPE The 7th International Conference on North Korean Human Rights and Refugees takes place in Bergen, Norway May 9 to 11. It is cosponsored by Rafto House (Norway's Chapter of Human Rights House Network). The other cosponsor is The Citizens’ Alliance for North Korean Human Rights from Korea. Registration is free. Just fill out this form and hit the 'send' button. There you have it. There is plenty to do all over the world. For those of you who live in the west coast. Thanks for the heads up. I have also added a fundraiser in Duluth Georgia.